Garage door have different parts, which control the mechanism of garage door. For proper upkeep, choosing the style while buying and in maintaining the garage doors, one should know about the different parts of garage doors. It helps in maintaining garage doors and helps the homeowner at the time of purchasing. 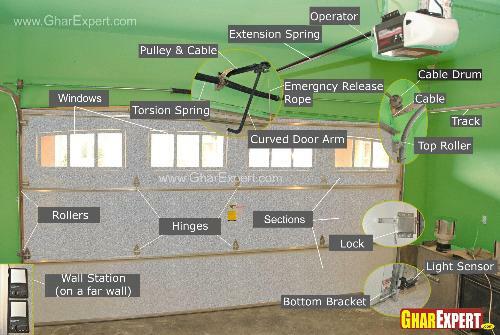 Section: Sections are used to connect the parts of garage door, which moves the mechanism and creates counterbalance between parts of garage door. Sections are connected with stiles, hinges, rollers and horizontal or vertical tracks. Sections also called as “Panels”. Panels are available in various materials according to the need and requirement of house owner. In case of rolling door, the commonly used material is MS steel or galvanized steel sheet. Garage door Windows: Garage door frames may consist of windows for ventilation and light. You can use glass, wire mess or acrylic panel for windows. Garage door Grill: In rolling door or shutter, rolling grills are provided for better light and ventilation if required in the garage. These are made of MS steel bars and provide safety against intruders. Bottom Bracket: It is part of bottom structure of garage door, which takes the load of door and providing attachment to cables with rolling section or panel. Cable Drum: It is like the drum that is groove and attached with torsion spring shaft. It lifts the door with cables at the time of opening or closing of door. Track: Track guides the door panel and support cables at the time of opening or closing of door i.e. either to lift or drop the garage door. Extension springs: These springs are provided along the horizontal tracks connected with track hanger, which keeps the springs and cables and other necessary parts of opening mechanism in required position. Torsion Springs: These springs are provided with cable winding drum and assist the door panel at the time of opening or closing i.e. either to raise the door or lower the door. Hardware used along both horizontal tracks. Hinges: Hinges are used to join sections or panels of garage door together. It allows them to rotate and end hinges provide carriage to the garage door rollers when they have vertical movement i.e. while up and down movement of garage door. Struts: These are provided for the garage doors having wider door opening and these are helpful to prevent the sagging or buckling. Cables: Cables helps in movement of door panels, at the time of opening and closing of garage door. One end of cable is attached with the bottom fixture of the door and other end is attached with cable drum. The other parts of the garage doors include pulleys, exhaust port, locks, handles, opener controlled by remote, keypads and garage door transmitter, weather-stripping etc. How to buy a garage door? Find guidelines and tips for garage door that you could use for buying. Learn about standard specifications, types of garage door, styles of garage door, different materials and insulation methods for garage door. Choose garage door that will tune with existing appearance of house and provide security and safety in less cost. Choosing a garage door requires consideration about material, finish and its appeal. Garage doors are available in different types of materials from wood to fiberglass. It will make easier for you to decide from the variety of material available for garage doors. Find which one is the best for you.